What is the minimum sized tank for fire-bellied newts, and how many can live together in various sized tanks? The answer depends a bit on your set up; for example how much land area and how much water you have. Most fire-bellied newts are pretty peaceful and will get along with other fire-bellied newts, though sometimes they will nip at each other a bit during feeding time, especially if they are crowded. In any case, you definitely want to avoid overcrowding as this will cause stress and make maintaining water quality more difficult. 1-2 newts in a 10 gallon, or 3-5 in a 20 gallon. Alternatively, start with a minimum of 5 gallons, then add 2-3 gallons per newt (e.g. for 2 newts it would be about 5+3+3=11 gallons, so a 10 gallon would probably be fine). If you have Japanese fire-bellied newts, you may want to go with a tank that is a bit larger than these recommendations, since these newts can get quite a bit larger than Oriental (Chinese) fire-bellied newts. 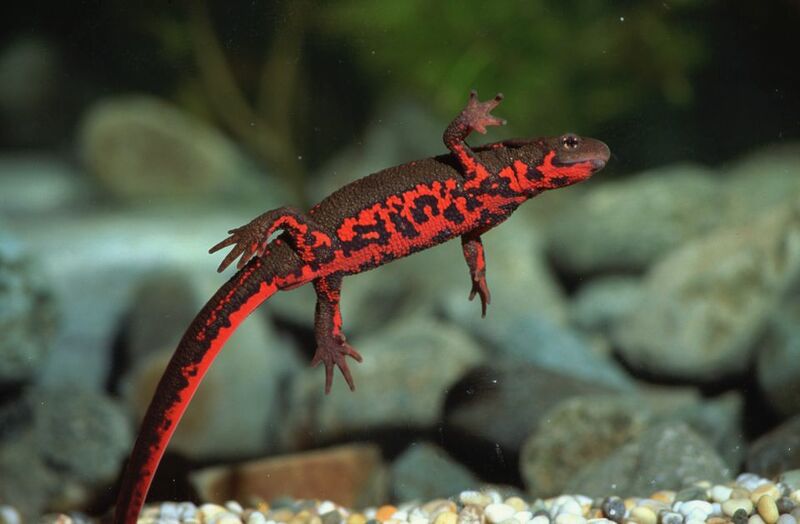 Also, consider that newts are primarily aquatic, so although they need a good chunk of land area, you'll want to make sure your fire-bellied newts have a good amount of water in which to swim around easily. So, depending on how much water your particular set up allows, you may want to go with a larger tank, as bigger is always better when it comes to space for newts. It is also best to stick to one species of newt per tank. Potential concerns relate to differences in behavior, requirements, size (larger ones will sometimes try to eat smaller ones), and temperament (some are not so peaceful) as well as possible health risks from different pathogens or toxins that may be seen in different species. How Toxic Are Fire-Bellied Newts? What Kind of Exotic Pet Can You Have in a Small Space? Can You Mix Species When Setting up a Terrarium? How Long Do Pot Bellied Pigs Live?